Below are my thoughts from the daily Bible reading of the West Side Church of Christ. Today’s reading comes from Acts 11 & 12. Before reading I invite you to pray and asked God to speak to you as you read his word. Also above in the tabs is a link to the Bible reading plan. I am in love with an Indie Rock Band Walk Off The Earth from Burlington, Ontario, Canada. They are incredibly talented group of musicians and vocalist. They are well known for their YouTube videos covering some of the most popular music of today’s current artists. Their video covers often take a song to an amazing new level. I am blown away by the talent God has blessed them with. Their most recent release was one of the members of the group along with two friends covering Miley Cyrus’ newest song Wrecking Ball. I am not a Miley fan, did not even care for the song until I listened to this cover. The pain and emotion displayed in this song is just amazing from these three ladies. Through their emotion I am reminded that there are so many people in our world whose lives have been confronted by the proverbial wrecking ball. Maybe it was their marriage. Maybe it was their finances. Maybe it is currently a relationship with family members. Maybe it is a job situation. Maybe it is legal trouble. Maybe it is some kind of consequence to sinful choices. As Christians how should we respond when people come to us in the midst of the wrecking ball experience of life? In our reading today we encountered a man named Barnabas. Barnabas was not his real name, only his nickname. Barnabas means Son of Encouragement (Acts 4:36). The early church has nicknamed this man by his dominate characteristic. So as the church grew, and people outside the Jewish community started becoming Christians, it is obvious to send the encourager to these new Christians. We can be confident that these people who were coming to Christ were certainly people who knew the wrecking ball of life. They were people who more than likely worshiped the god’s of the day, not the one true God. But soon they began worshiping the one true God and accepting Jesus as Lord. Barnabas goes and is excited to see God working. It is here that he begins encouraging … “When he arrived and saw the evidence of the grace of God, he was glad and encouraged them to remain true to the Lord with all their hearts.” (Acts 11:23 NIV) From Barnabas we can learn a valuable lesson. When people in our church, in our lives, in our communities encounter the wrecking ball, often what they need most is a little bit of Barnabas. They need encouragement. They need to be uplifted. 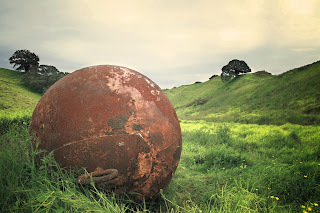 Let me encourage you to face the wrecking ball with encouragement to remain faithful!